Recently I was selected as a travel scout for Travel Insurance Direct (TID). Along with being selected as I was given an iPad and 1 years worth of travel insurance to pursue my travels with. As a travel scout, I was asked to make a total of 10 photo submissions of some of the unique places I had traveled to within this past year. The Galapagos Islands was a last minute adventure for myself and a friend. We arrived in Ecuador and found a last minute cruise going to 3 of the main islands: Isla Santa Cruz, Isla Floreana and Isla Espanola. We spent 5 days exploring the vast biodiversity which Charles Darwin had famously based his theory of evolution! It was fascinating learning how all the different animals have evolve in order to survive in such a dynamic environment. A lounge of marine iguanas bathing in the sun to warm their cold blooded bodies. We watched as the Galapagos sea lions stretch and bathed in the sun. On our trek through Santiago Island we spotted many Galapagos land iguanas - This particular species get its bright yellow colours from the yellow flowers it consumes on the island. A Pelican flying overhead in search of food. The giant Galapagos tortoises are gigantic and they are incredibly impressive up close! 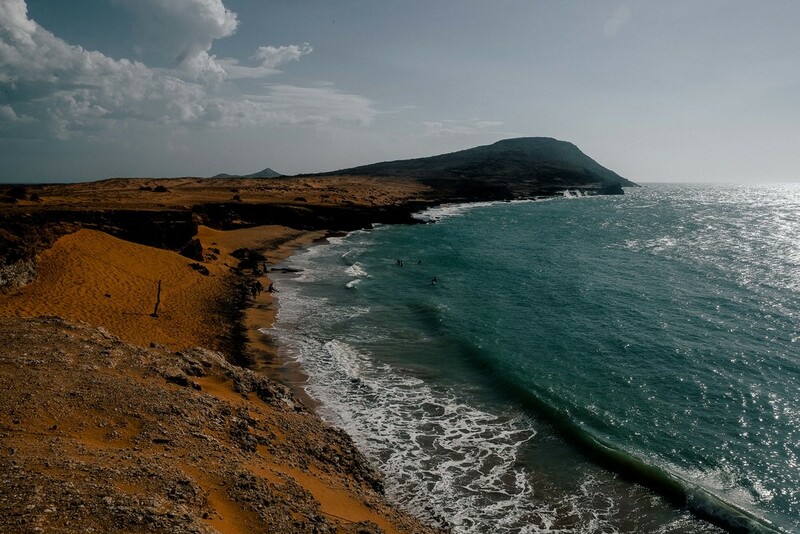 Entering Colombia I had heard a lot about Guajira peninsula from other travellers. They told me how isolated it was and how beautiful it was to see the ocean and the desert come together to create an insane contrast in nature. When I arrived it was just as amazing as I had heard. I spent my days chilling in hammocks and swimming in the beaches and my nights laying on the dunes starring up at one of the clearest views of the milky way you can imagine! In the north coast of Colombia - the ocean meets the desert. My main reason for visiting the north coast besides its diverse beauty was the remoteness of the area. There is no internet - you get to really appreciate just being there, having genuine conversations and enjoying life. 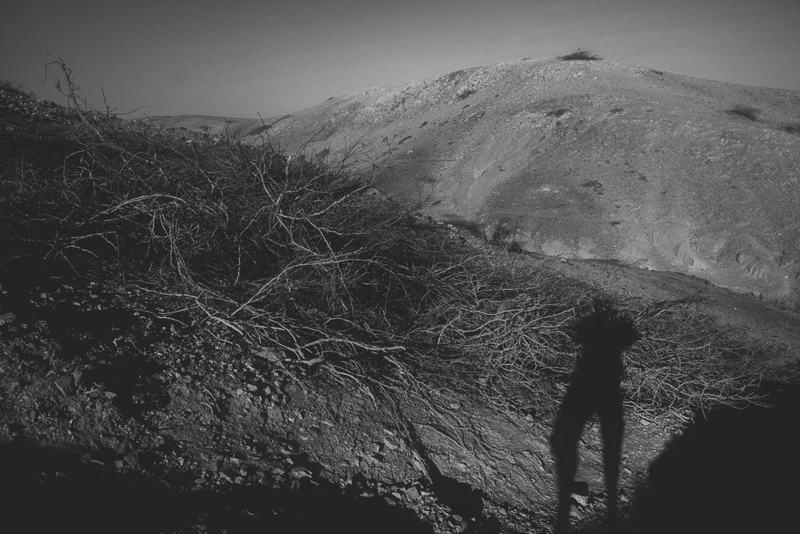 The baron landscape of the La Guajira desert. Waves washing up against the dunes on the beach. An impressive view of the vast desert dunes meeting the Caribbean. A couple of dockhands are taking a break before the arrival of the next boat with supplies for the island. The boats supply the island with fresh seafood for the village. They also serve to transport visitors to nearby islands for sightseeing. Trekking through parque Torres Del Paine was one of the toughest and most rewarding experiences in my life. My friend and I spent a week exploring Chilean Patagonia trekking and camping along the famous W circuit in Torres Del Paine. Over the week we saw mountains, waterfalls, rivers and glaciers as we moved through some of the most incredible landscapes. We spent a couple of days in Puerto Natales, a primary transit point for entering the National Park - Torres Del Paine. Down by the docks is a small graveyard of decommissioned boats against a backdrop of mountain peaks. Our first night in Torres Del Paine with an insane view of Punta Bariloche from our campsite. From our camp ground Refugio Grey it was a 4 hour trek to reach the lookout where we could get our first view of the sheer enormity of Glacier Grey. It was a an absolutely breathtaking sight and well worth the journey. We woke up at 3:30am in the morning to start the Las Torres trek. If you get there early enough you can witness the famous towers go from grey to red as the sun rises over the horizon. The wind in Patagonia is known to be relentless. We witnessed the power in our campsite - the wind was so strong it was literally lifting water straight out of the lake! The Embera are a tribe of indigenous people in Panama. Spending a night in the village and having the opportunity to live among the villagers was an unforgettable experience. In the village I met many of the villagers and it was inspiring to see how happy they were, embracing their traditions and living with only the essentials. One of the young Embera men picked us up from the docks in a traditionally made canoe. The canoe is extremely important to the Embera, historically the art of crafting a canoe like this was a right of passage for Embera men and sometimes served as a prerequisite for marriage. We travelled through a myriad of rivers and canals to get to arrive at the village. The Embera have a traditional form of skin decoration called the Jagua Tattoo. The decoration is made from the application of an extract from the fruit Genipa americana. These intricate patterns are generally applied using tools made from balsa wood on special occasions. Three Embera children are play fighting by the river. It is comforting to see the children of the village finding ways to have fun without technology, play fighting, playing tag and even drawing games on the ground with rocks. This brings back nostalgic feelings from my childhood before technology really took hold of our lives. Jeriko - a curious young man of the Embera was very eager to share stories and show me around his village. The Embera women are preparing lunch for the village. This is usually a combination of locally caught fish and plantains, the fish are cut into fillets and plantains pressed before being cooked and served in a handmade plate made from banana leaf. When we arrived in Peru my friend and I signed up for a 5 day trek through the savage mountain (Salkantay) to get to the lost city of Machu Picchu. It was an experience of a lifetime walking through the ever changing terrain - we saw snow, mist, sunshine and everything in between! On the first day of our journey to Machu Picchu we were picked up from our hostel and driven to Soraypampa where the mule drivers were awaiting to load our gear onto horses and mules. We spent a little bit of time stretching and meeting other trekkers before begining our 5km journey to our first camp ground at the base of the Salkantay mountain (6247m). As we arrived we were lucky enough to see some snow around the campgrounds as we set up our tents for the night. We woke up to a snow covered camp - it was a beautiful sight to wake up to. It is amazing to arrive in a place and feel like you have been transported to another overnight. After breakfast we trekked up to the Abra Salkantay (4600m), the highest point of our trek where we were met with some breathtaking views of the Salkantay mountain. The weather changed so quickly as we descended from the high Andes into a cloud forrest environment - within an hour of leaving the campsite in the morning we found ourselves amid tropical vegetation. Ruben is one of the guides in training bringing us on this epic journey. On our third night after setting up camp he took us on a mini trek to a nearby stream for a much needed rest. We woke up really early today to beat the crowds to Machu Picchu and spend as much time as possible exploring the lost city. It is mind boggling to imagine how the Inca civilisation was able to build such a grand city in such a high location atop the Andes mountains in Peru. I visited Oruro during Carnival de Oruro, a religious festival dating back more than 200 years. It was an amazing experience being amongst the brilliantly decorated locals performing their traditional folk dances. When we arrived in Oruro, the bleaches were absolutely packed full of locals and tourists alike all here to witness the spectacular folk dances, extravagant costumes and lively music. When the Carnival de Oruro is on, the quiet town of Oruro can draw crowds of up to 400,000 people. Earlier on in the day some of the earlier parades were made up of some younger performers showing off their dance skills. All the outfits on the day were absolutely amazing and extremely artistic. The outfits ranged from extravagant dresses worn by the women to wild costumes complete with demonic masks - decorated with bells, ornaments, shimmering breastplates. During the Carnival in Bolivia water and foam fights begins to take place everywhere, even before arriving in Oruro, I had already had my share of impromptu fights with locals while wondering through the streets of La Paz. Oruro was no exception, children were waging foam wars amongst the parades with cans of foam as if they were guns and fun battles even broke out between the rows in the bleachers between spectators. The parade party are chanting in preparation for their run down the strip in front an incredible crowd. We visited the Valley of the Moon in the Atacama Desert. The weathered stone and sand formations carved by the elements over time gave the valley an incredible other-worldly atmosphere. The Atacama desert is a plateau in South America, covering a 1000km strip of land on the Pacific Coast, west of the Andes Mountains. Undisrupted by people, the winds carve lines into the sand dunes creating beautiful patterns. Standing on the top of the weathered down rock I can feel the power of the winds that created the sharp and sheer textures. With its baron landscape, natural beauty and lunar landscape, this image of the terrain is why this valley was named after the moon. The view from one of the highest view point is spectacular. After hiking to the top we spent some time sitting around and taking it all in. We stayed until late so we could catch the sun setting over the valley. The largest salt flat in the world - Salar De Uyuni sits south west of Bolivia. We made the trip from the border of Chile in a 4WD and passed through desert, lagoons and geysers to reach the salt flat. At the border of Chile and Bolivia (Hito Cajon) as we were setting up to begin our trip from San Pedro de Atacama to Salar De Uyuni, I found a skull of a dead llama. 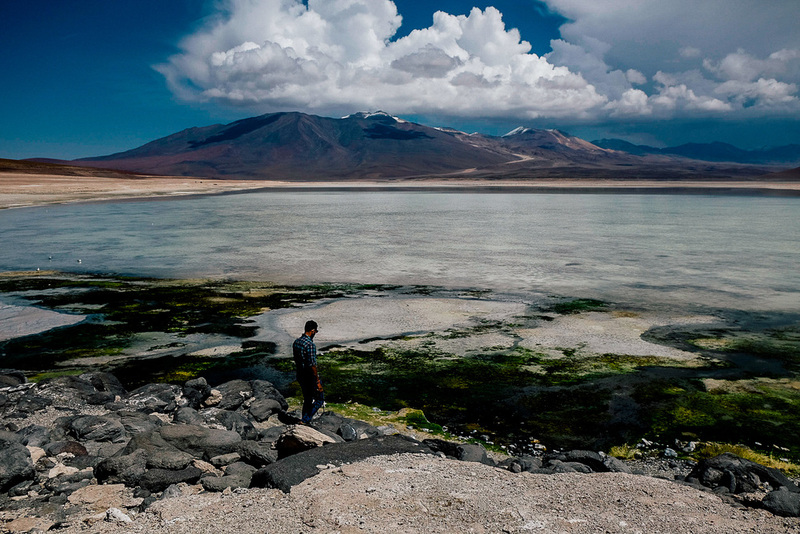 At the foot of volcano Licancabur is Laguna Verde (Green Lagoon). It has mineral suspensions of arsenic and other minerals which gives it a varying turquoise to dark emerald colour. We visited the salt flats during sunset. The raining had created a reflection as far as the eyes could see and as the sun turned the sky purple we witnessed a truly magical sunset. As we arrived at the geyser the weather changed and it started snowing suddenly. It was amazing because it was so unexpected, it was sunny and hot minutes before arriving at the geysers! The antique train cemetery was a hub for the trains carrying minerals on their way to the Pacific Ocean ports. In the 1940's it was decommissioned when the mining industry collapsed and many trains were left abandoned. Acatenango is a volcano located near the city of Antigua and has a peak that soars to 3976m. The overnight climb to the peak of Acatenango was one of the hardest hikes I have ever done in my life. But when we made it to the top the view was absolutely breathtaking and definitely worth every step. Trekking through one of the unique ecosystems (the cloud forrest) to reach our camp site - 800m below the peak of volcan Acatenango. 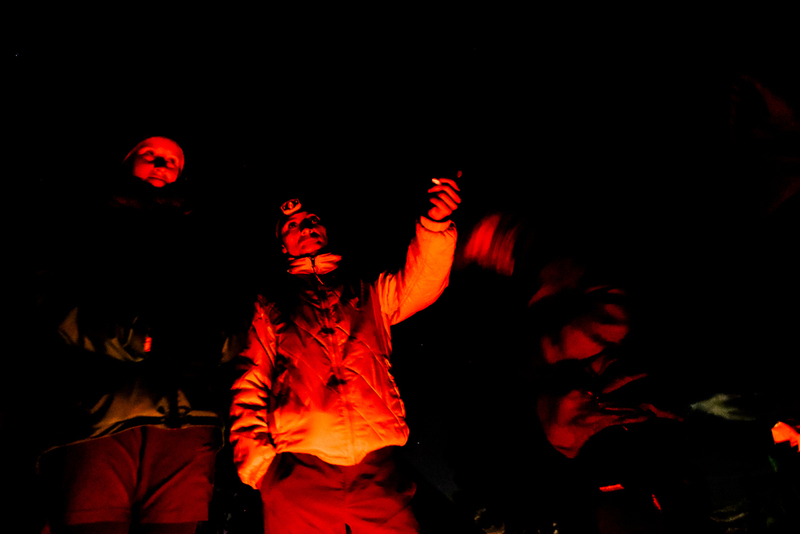 When we arrived at our camp, we set up our tents and made a fire to warm ourselves up. At this altitude the temperature quickly fell to a chill. At dusk we witnessed a truly majestic view of the clouds pouring over the peak of volcan Pacaya. We woke up at 4:30am to begin our final ascent to the peak of the volcano. The hike was insanely tough but the view of volcan Fuego from the top was worth the pain. Our guide David telling us stories about volcan Fuego around the camp fire. Eruptions occurred every few minutes and the noise whipped through the air like the sound of thunder. The sun rose and set the clouds on fire as we made our final climb to the peak. It took us two attempts to get to Glacier Viedma because the weather was so extreme, the winds and waves would not allow us to dock! On our second attempt we finally made it onto the glacier and we got to get close and personal with one of the largest glacier fields in the Southern Patagonian ice fields. The weather on this particular day made it too dangerous for us to dock and proceed with our trekking and glacier climbing. So we abandoned our voyage to return the next day hoping for calmer weather. From where I stood on top of the glacier wearing my cleats and ready to start my trek. The scenery during the trek was surreal, there were layers of glaciers each proceeding the next like a wave. From a distance a group of ice climbers explore the Patagonian ice fields in hopes of finding their next epic glacier climb! The sharp glaciers rising up out of the cold Patagonian waters creating insane natural patterns. From where we docked and the beginning of our trek, the glacier fields meets lago Viedma.